Welcome to the Wilderness. How did you get here? I came by way of the Consortium of Endowed Episcopal Parishes conference in Washington D.C. last week. The theme of the conference was “Faith. Power. Possibility.” It seems an appropriate theme for the transition from the light and truth of Epiphany to the wilderness of Lent. Members of the conference were inspired by the feeling of sanctity in and around our National Cathedral, a place of monumental beauty in a great city. Speakers and participants reflected on the theme of “Faith. Power. Possibility” out of the depths of our Christian tradition and our diverse ministry contexts. I gained a deeper appreciation for the good work being done across the Episcopal Church to strengthen and equip the people of God to live the truth of the gospel wherever we find ourselves. As we make our transition from the ordered streets of Epiphany into the Wilderness of Lent, we remember that effective disciples and apostles must become more and more like Christ in our work and witness. We are people whose strength is rooted in faith. Our power comes from being members of the Body of Christ. New possibilities for godly living in a troubled world emerge most compellingly through prayer, fasting and humble service. My friend, Canon Chris Chivers, principal of Westcott House in Cambridge joined us at the Cathedral as a distinguished visiting preacher this past Sunday as we inhabited the Gospel text of Jesus’ Transfiguration together. He helped us find our way to the edge of the wilderness we now enter. 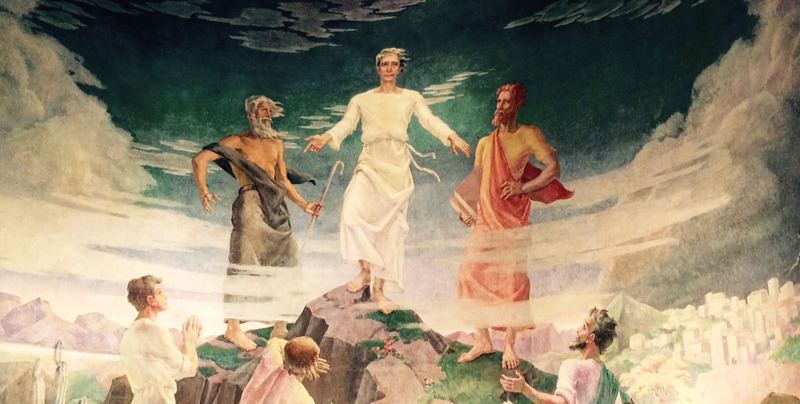 Chris preached on David Painter’s mural of the Transfiguration below, which is above the altar at St. Thomas’s College in Colombo, Sri Lanka. He said, “Influenced by western artists, Paynter forged an idiom perceived nonetheless to be distinctively Sri Lankan. The mural is in fact his final masterpiece. The context is key. A school. What would one say about this story in the context of a school? Of course, St. Thomas Aquinas once tellingly described the church as a school for holiness- a school for human whole-making. The pupils gaze daily at a meditation on leadership that most contested of words in Anglicanism right now – and beyond, in your society and mine – but that most necessary of all concepts for human flourishing. Look first at the figure of Moses to the right of Jesus – indigenized as a silver-haired Sri Lankan – and we see a man who is solid in his convictions. His feet are firmly planted on the rock beneath him. The tablets of the law are neatly tucked under his right arm. He is fully clothed, poised and confident. He is law giver, framework-setter, well used to the ordered life of the city that lies behind him with its tightly packed buildings and grid-like streets. He possesses authority. He represents order. His is the settled world of meetings carefully minuted and constitutions carefully crafted. Look, by contrast, at Elijah to the left of Jesus. His chest is naked. His hair is being blown. His feet are unstable. They do not stand on lush grass like Moses&apos;s feet. With a nod to Bellini – the Bellini of The Agony in the Garden – they stand on more barren ground. Indeed, it seems from the position which his feet and legs take that Elijah is about to totter and fall. The pilgrim&apos;s staff that he holds suggests journey and movement but it also serves simply to hold him up. Behind him lies the wilderness. A place of adventure and possibility. A place, as we will discover on Ash Wednesday, of self-discovery. A place for tough questions in which to discover and explore identity. But a place also of temptation, of tempest. The wind blows from behind Elijah. It&apos;s as if the restless journeying prophet – with his difficult questions – is being blown towards the settled city. There perhaps lies the answer to adventure and disruption – in the measured orderliness of daily life. But that reading – which might suggest that it&apos;s the law that always holds the prophetic in check or that control always gains the upper hand – is subverted by the central figure of Christ. His hands seem to take a somewhat unnatural even awkward position. An open right hand beckons the adventuring, questing world of the desert forward and a reversed left hand suggests that the settled world of predictable order must make space for this. Of course this tension between what the wind suggests and what the hands indicate creates the artistic drama of the mural but it also points to the deep questions for us that are also posed to our fellow disciples variously depicted as worshipping the Godhead, shielding themselves from the Christ-light and with open arms welcoming a Spirit of challenge and renewal. 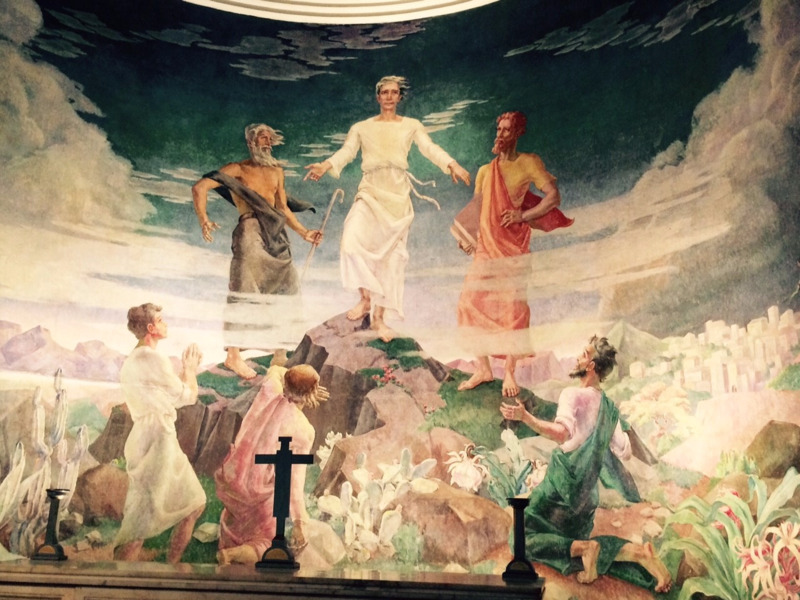 These figures are aligned in the chapel – since this mural is behind the altar – with the pupils who sit or stand in their places and who kneel to receive the sacrament. What sort of leadership will they choose to embrace? In the story of course – and Paynter could not represent this, except perhaps very clumsily in his mural – the disciples suggest tabernacling this experience, putting the genie into a bottle as it were, to control and own and domesticate it. ‘Let&apos;s build three booths,’ they say. And in so doing they are on the side of the Moses’s of this world for whom control is everything. But the gospel can&apos;t be controlled, the genie can never be put back into the bottle, and in beckoning Elijah forward Jesus makes this explicit. As we move from the settled world of Epiphany truth to the disruptions of the Lenten wilderness we face a choice. We know that in truth we need law and prophecy, order and disruption, structure and adventure. We need a balance. Growth in holiness is all about this. Welcome to the wilderness. Your questions, struggles and yearnings are welcome here. This is a place of discovery and encounter. This is a place of renewal and growth in holiness. I look forward to sharing this journey with you as together we discover God’s presence and call more deeply at the Cathedral of the Incarnation.